posted: February 06, 2014 by: Alison Skala, DVM Tags: "Clinic Specials" "News"
Periodontal disease affects 85% of dogs and cats by age 3, making it one of the most common diseases we see. Periodontal disease occurs around the outside of the tooth near and beneath the gum line. Plaque (bacteria mixed with saliva) starts being deposited on the enamel of the tooth as soon as the permanent tooth erupts in a puppy or kitten. When plaque is allowed to remain on the tooth and is not brushed off, it mineralizes into tartar. Once tartar is formed, it cannot be brushed off. The tartar can harbor harmful bacteria that can damage and infect the teeth, gums, bone and ligaments that surround the teeth. These bacteria can also travel to other areas of the body and lead to infections of the heart, liver, kidney and other organs. Gingivitis (infection and inflammation of the gums) is reversible. Once bone loss associated with periodontal disease starts, it is not reversible. A thorough oral examination of your dog or cat is the first step towards a healthy mouth. An oral exam will include checking the alignment of the teeth and jaw, feeling the lymph nodes and muscles of the head and neck, looking in the mouth for any abnormalities of the teeth and tongue (i.e., broken teeth or masses) and assessing the degree of periodontal disease. If periodontal disease is found, a dental cleaning with anesthesia may be recommended. Anesthesia is needed to look more closely at your pet’s teeth and oral cavity and to ensure that a thorough cleaning is done. The teeth are ultrasonically scaled (tartar is removed with a special dental tool) and polished, the subgingiva is flushed and all the tissues around the teeth are probed to measure pockets and look for signs of tooth decay. Once a dental cleaning is performed, home care will be recommended to continue to keep the mouth healthy. What can you do at home to protect your pet’s teeth and mouth? Studies have shown that brushing three times a week was adequate to maintain healthy teeth and gums, but that daily brushing was needed to control existing gingivitis. You cannot substitute dental home care (i.e., brushing) for a full dental cleaning if your pet has more advanced dental disease. Pets who have mild tartar and healthy gums can benefit greatly from home dental care including brushing the teeth at least three times a week, dental wipes or rinses (which are best used daily), dental treats (including Greenies) and dental diets. There are many products available over-the-counter, but there are some that are recommended by the Veterinary Oral Health Council, which awards its seal of approval to products showing scientific evidence of plaque and tartar reduction. Dental treats and diets help clean teeth by providing abrasion against the tooth. Dental treats have variable evidence of plaque and tartar reduction and should be used with caution. Chews can be swallowed in large chunks and cause obstruction or can break teeth in pets with more advanced dental disease. Cow hooves and bones provide little benefit and can break both healthy and diseased teeth. Use your best judgment and supervise your pet when using any chew treat. Dental diets are specifically formulated to help clean the teeth by being specially shaped, larger and higher in fiber than normal kibble. These features cause the dental diets to be chewier and this helps clean the molars and premolars (the chewing teeth). Regular dog kibble doesn’t help clean teeth because it lacks these properties. February is dental health month here at Green Meadows Veterinary Hospital, which means that we offer a discount on dental procedures scheduled during the month. If you have questions regarding your pet’s oral health or would like to schedule a dental procedure, please call us at 614-846-9644 to schedule an appointment today. 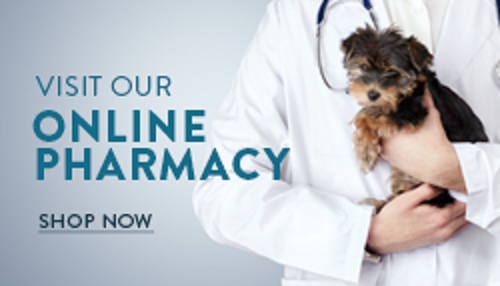 Let us help you get your pet on the road to a healthy mouth!